Founded in 1982 to promote the visibility of gay people in sport, they are now open to anyone who is competent in their sport, and are described as “a hymn to love” to advocate a society for social diversity. Irish athletes will take part in 40 sports, including running, boxing, badminton and soccer over the 10-day event, from August 4th. Aidan Walsh, chairman of the national committee for Team Ireland, said there remained a lack of role models for Irish gay, lesbian, bisexual, and transgender people in sports. While “rugby and GAA have been very good” there remained a dearth of role models for the community in soccer. He said there was about 20 per cent fewer LGBT people involved in sport than there were in the general population, and while reasons for this needed to be explored, it was “clear there remains a stigma” about being gay and interested in sports. Team Ireland is fundraising for a team kit, which Mr Walsh estimates would cost a total of €5,000-€6,000. 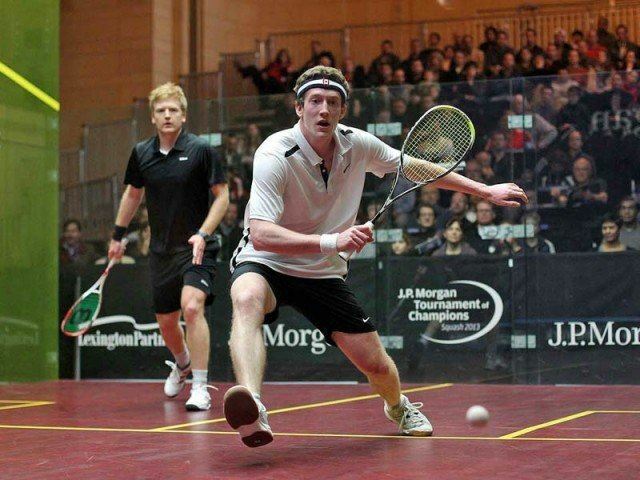 Squash champion Todd Harrity, who has twice picked up the US Nationals title, became the first openly gay man at the top of the sport this week. In a post to social media, the 27-year-old athlete wrote: “To everyone I know, and to all who know me, I have something that I am finally ready to get off my chest. There are few openly gay men at the top levels of most professional sports, although there are many gay role models in women’s leagues. OLYMPIC ATHLETES TELL THE WORLD "WE’RE HERE. WE’RE QUEER. GET USED TO IT." Openly gay athletes at the 2018 Olympic Games are becoming fan favourites. When South Korean organizers failed to raise enough money to build a Pride House at the 2018 Winter Olympics in PyeongChang, the Canadian Olympic Committee stepped in to help. The first Pride House was created in Vancouver for the 2010 Winter Olympics as a safe place for LGBTQ+ athletes, fans and their allies from across the globe to gather. Also frequenting Pride House is Adam Rippon, who became the first openly gay man from the U.S. to win a Winter Olympic medal when he was awarded the bronze in the men’s free skate Feb. 11. English figure skater John Curry won the gold medal at the 1976 Winter Olympics in Innsbruck, Austria, but was outed by the media after having what he thought was an off-the-record conversation. Following that public outing, Curry faced more questions about his personal life than any of his athletic accomplishments. U.S. figure skater Brian Boitano won the gold in 1988, but didn’t publicly confirm he was gay for 25 years. Even the always over-the-top Jonny Weir didn’t officially come out until the year after he charmed the world at the 2010 Olympics. But in 2018, there are 15 openly gay and lesbian athletes competing at the Winter Games — and they’re winning medals. Canadian figure skater Eric Radford became the first openly gay Winter Olympian to win a gold medal, while Dutch skater Ireen Wust won a gold in the 1,500 metres and a silver medal in the 3,000 metres, making her the most decorated Dutch Olympic athlete ever. Wust has eight medals and is openly bisexual. It was freestyle skier Gus Kenworthy who broke the ice on opening day of the 2018 Olympic Games by posting a photo on Twitter stating, “We’re here. We’re queer. Get used to it.” But it was Rippon’s response to a question about what it’s like to be a gay athlete, that quickly made him an Olympic favourite. Six teams have already applied for this program. Make your team the next one! The Gay Games Uniform Program is back. Save big on customized NIKE merchandise for your team. The Gay Games Uniform Program is launching earlier this time, giving more teams the opportunity to get top-quality NIKE merchandise featuring your team’s logo. Dozens of colors and styles are available. You can even add individual names and numbers to your team's uniforms. The exclusive Gay Games Uniform program is presented by the Federation of Gay Games, NIKE, and BSN Sports. If your team wishes to participate in this program, it’s easy. One person from the team should complete an online application and pay the required administrative fee. The designated “Uniform Captain” will then be contacted by a professional representative of BSN Sports to set up the customized online “My Team Store” that your team will use to shop for the items you choose. Both FGG member organisations and non-member organisations in all countries are eligible to participate in this program. See the online application and program web page (https://gaygames.org/NIKE-Gay-Games-Uniform-Program) for full details. Make sure your team looks great in Paris. CLICK HERE for the Gay Games Uniform Program! Paris 2018 Gay Games 10 Official Merchandise can be purchased HERE. 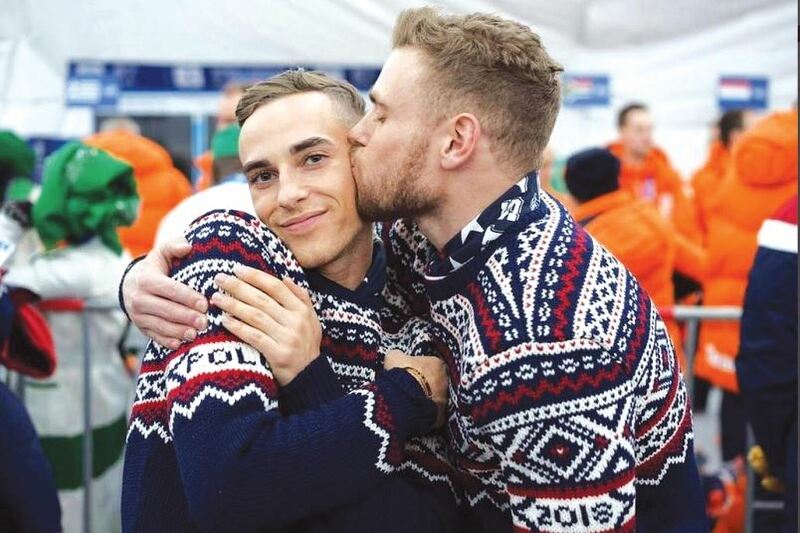 With the liberating buzz generated by 2014 Olympic medalist and out athlete Gus Kenworthy cheering on new bestie Adam Rippon's medal-winning performance for the U.S. figure skating team at this year's Winter Olympics in PyeongChang, it's an inspiring year to be an LGBTQ amateur athlete participating in the 2018 Paris Gay Games. Coming to Paris August 4-12, this year's historic event features a dynamic mix of traditional summer and winter sporting events, from figure skating and ice hockey to basketball. With many sports filling up, it's important to register ASAP to secure your spot. On Saturday, February 3, International FrontRunners and the Federation of Gay Games held the kickoff of their quadrennial International Rainbow Memorial Run, which raises awareness both of the Gay Games and AIDS – a debilitating illness and an empowering event whose histories are interwoven in the defining moments of our community. The memorial run always begins in San Francisco – birthplace of the Gay Games and a crucial battleground for so much of the fight against AIDS – but has substantially changed with evolving circumstances through the years. Tom Waddell Award-winner Brent Nicholson Earle first organized it in 1990 as a relay run to Vancouver – the first time the Gay Games were held outside of San Francisco. Four years later it was a rollerblade relay across the country to New York City, host of Gay Games IV. 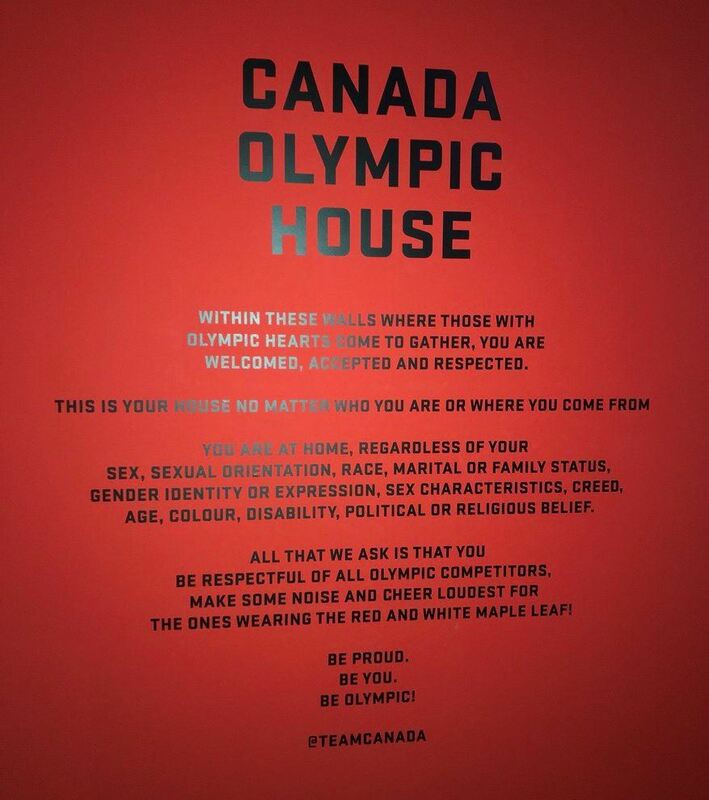 This year, Canada House will double as Pride House, offering a space for LGBT athletes from all competing countries. There are 13 out and proud LGBT athletes at the Winter Olympics, out of more than 3,000 competitors. While that number may seem low, it’s almost double the number who were out at Sochi — seven. “I promise, for every athlete that's out, there's at least one or two that aren’t,” said Mark Tewksbury, a Canadian swimmer who won Olympic gold in 1992, and later came out as gay. Homosexuality is under the radar in South Korea, with limited public discourse on LGBT rights, or support for the activists fighting for them. That lack of support showed recently when organizers failed to raise funds needed for an LGBT centre at the Olympic Village in Pyeongchang. But then Canada stepped in. Canada House will now double as Pride House. The first Pride House was in Vancouver in 2010. WHAT’S IT LIKE TO BE GAY IN SOUTH KOREA? There are no laws against homosexuality in civil society in South Korea, but many LGBT people face family pressure to stay in the closet and even enter into heterosexual marriages, said John Cho, an assistant professor of global studies at Sarah Lawrence College in New York. Cho did field research on gay men in South Korea, and found that most Koreans do not consider discussion of homosexuality within the public sphere to be an appropriate topic. Homosexuality has been politicized recently by members of the Christian right, he told The Current's guest host David Cochrane, who are using it "as a political tool to bolster its own power." The internet has had a galvanizing effect on the gay and lesbian movement in the country however. "A movement that had all but died in 2007," he said, "last year became this very vibrant movement that had 70,000 people show up for its pride parade." The excitement surrounding the historic 10th Gay Games intensified by the romance of Paris is driving a high level of early registrations for the August event. With more than 40,000 visitors, up to 15,000 active participants and 3,000 volunteers expected, reservations for the Games and accommodation are filling up. The Games' golf and tennis events are already full and a number of other events are nearing capacity. Pie charts on web pages (www.paris2018.com) for each designated event indicate the number of participants who have already registered. 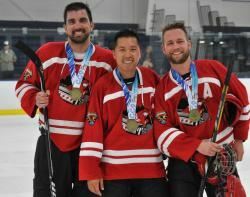 Gay Games 10 not only will feature swimming, track & field and other summer events, but also two sports associated with the upcoming Winter Olympics: figure skating and ice hockey. Paris 2018 is especially exciting because approximately 20 athletes and musicians who participated in every edition of the games since Gay Games I in San Francisco (1982) will be returning for Gay Games 10, according to Doug Litwin, Officer of Marketing, Federation of Gay Games. Former Olympian Dr. Tom Waddell, who came out in the 1970s after participating in track & field at the 1968 Summer Olympics in Mexico City, founded the games 36 years ago. One of these veteran competitors is wrestler Gene Dermody, who, at age 69, is planning to compete in Paris and then retire from the Games shortly after. It's been a satisfying and emotional journey since his first Games in 1982. Dermody learned about the Games when we saw a poster in Greenwich Village. His experience was so transformative that he moved to San Francisco and built a more integrated life as an out gay man. Gay Games founder and former Olympic track & field competitor Tom Waddell (1968 Summer Games) presented Dermody with the Bronze Medal he won at his first Games. "It was a mind-blowing experience. We had a huge wrestling tournament and I'd finally found my tribe." All the athletes have indelible memories of the competition. A former member of the New York University wrestling team, Gino thought he was "a hotshot wrestler" when he first participated in the Gay Games. However, he soon learned the competition at the highest level was extremely competitive. He did well most years but didn't come out on top until he traveled to Australia two decades later. "My most memorable experience was in Sydney in 2002 for Gay Games VI, when I finally won a gold medal," he says. "It was amazing. I had injured my Achilles in the first match and then had to win over seven other guys." 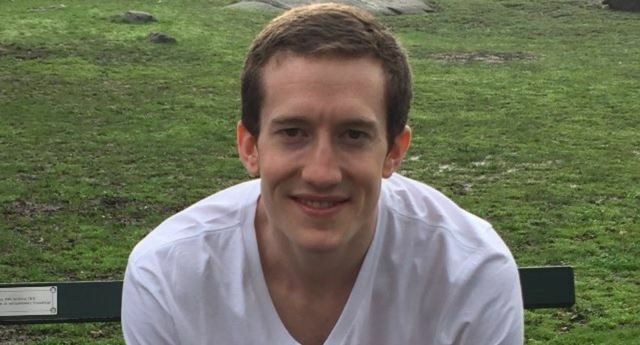 James Hahn isn't just happy to be attending his tenth gay games; he has long-term plans. "My first Games was in 1982 when I was just 21 and I hope to make it all the way to Gay Games XV in 2038," says the San Francisco-based bowler. He's seen many changes through the years, as cities evolved from acceptance (or reluctant acceptance) to actively courting the Games-a tremendous opportunity for each site's tourism industry. 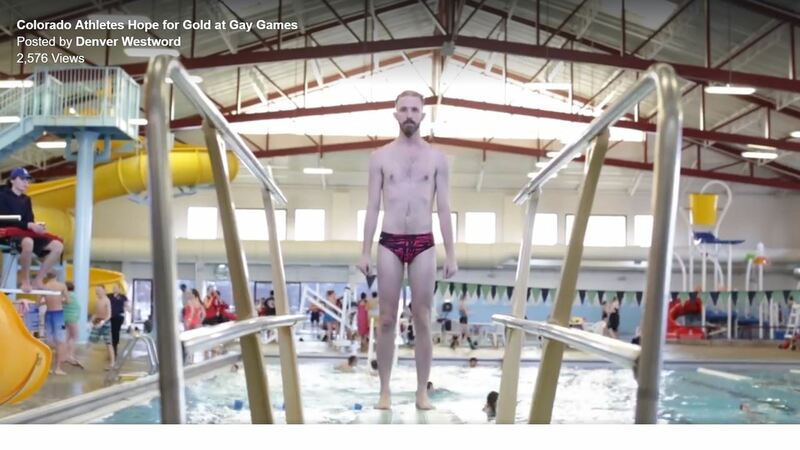 "It is my observation that major municipalities throughout the world now court the Gay Games. We have approximately the same number of participants as the Olympics, we use many of the same venues, we have many of the same sports as the Olympics, and it takes a significant amount of money and volunteers to produce the Gay Games." New York-based Charlie Carson will be swimming in his tenth Games. "There are six swimmers who've been to all of the Gay Games, (though) I'm the only one not from a California team," says Carson. His most memorable event remains the first. "Definitely walking into the opening ceremony at Gay Games I, with 1,300 participants parading into Kezar Stadium to the theme from 'Chariots of Fire' with several thousand others in the stands yelling. It was a watershed moment and we were thrilled to be there. It's hard to convey how different an event this was for LGBT people being open about who they were then the norm back then," Carson says. "Except for political gay pride marches, there hadn't been anything like it in public before." Gay Games Ambassador Esera Tuaolo’s inaugural Inclusion Party at the Super Bowl was a big hit in Minneapolis on Wednesday night, attracting hundreds of revelers expressing support for LGBT inclusion in football. 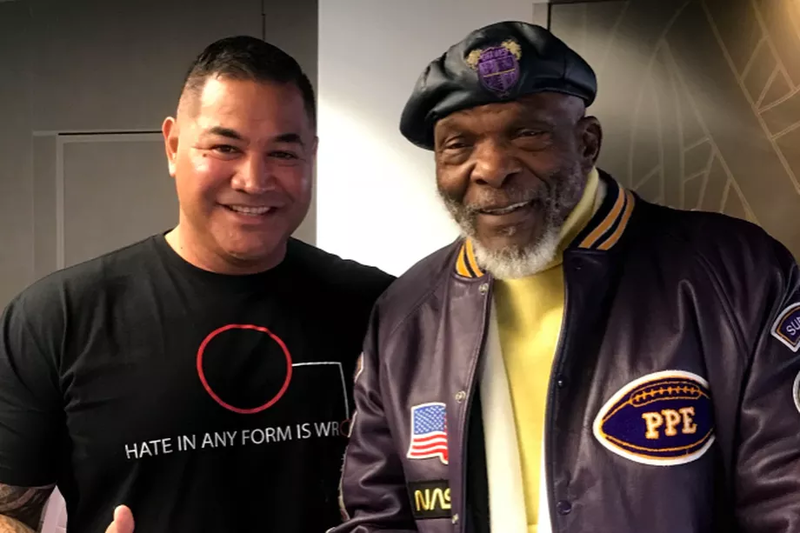 Tuaolo, a former NFL player who came out publicly as gay after he retired, wanted to create a tentpole event around the Super Bowl to continue the push for equality and inclusion in his beloved sport of football. Tuaolo called the Super Bowl in his adopted hometown of Minneapolis an “amazing opportunity” to demonstrate inclusion in the NFL. Among the approximately 300 people in attendance Wednesday night were Minnesota Vikingslegends Robert Smith and Carl Eller, Atlanta Falcons assistant general manager Scott Pioli, and openly gay sports writers Chris Hine and Steve Buckley. A number of athletes and coaches profiled by Outsports were also in attendance, including Justin Rabon, Brad Neumann and Lars Egge. Minneapolis Mayor Jacob Frey also took time out of his busy schedule to attend and say a few words. The entertainment for the night, hosted at the Pourhouse in Downtown Minneapolis, was provided mostly by Tuaolo and his compatriots on last season’s The Voice. Wonderful singers like Natalie Stovall, Kristi Hoopes, Rebecca Brunner, Adam Cunningham, Keisha Renee, Mitchell Lee and Dennis Drummond joined Tuaolo on stage for some fantastic performances. Proceeds from the event, in addition to successful silent and online auctions, went toward local Minnesota LGBT charities, including Hate Is Wrong, Pacer’s National Bullying Prevention Center and Avenues For Homeless Youth. With the Super Bowl in Atlanta next year, Tuaolo will continue his Inclusion Party. He played defensive end for both the Vikings and Falcons during his NFL career.